The notification area can display both application and system icons. Icons for appli¬cations appear in the notification area for several reasons. Some programs, such as Action Center, are managed by Windows itself and their icons appear periodi¬cally when notifications are pending. Some other types of programs, such as antivirus software, may be configured to load at startup and then run in the background. You can often enable or disable the display of icons through setup options for the related applications. 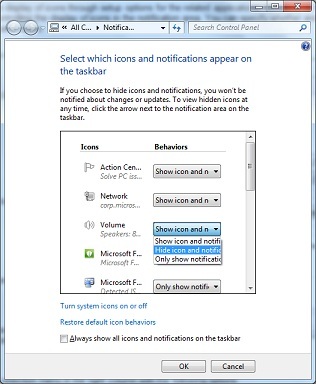 Windows 7, however, provides a common interface for controlling the display of icons in the notification area. You can specify whether and how icons are displayed on a per-application basis. 1. 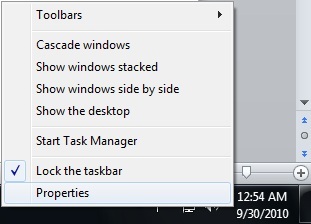 Right-click the taskbar, and then click Properties. 2. 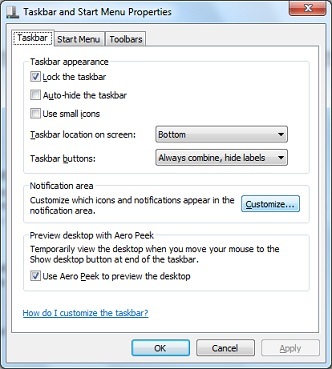 On the Taskbar tab, under Notification Area, click the Customize button. 3. If you want all icons to be displayed, select Always Show All Icons And Notifi¬cations On The Taskbar, click OK, and skip the remaining steps. 4. If you want to customize the appearance of icons, clear Always Show All Icons And Notifications On The Taskbar. You can now optimize the notifica¬tion behavior. 5. When you have finished updating the notification entries, click OK twice.